Malcolm X (1925-1965) enrolled in the Nation of Islam in 1947 while an inmate in jail and later rose to become national spokesman of the Honorable Elijah Muhammad. His father was a “Garveyite Baptist preacher” and his family later moved from Nebraska to Michigan. After the assassination by whites of his father in Lansing, his mother took ill and the children were placed in foster-care. Subsequently, he moved in with relatives in Boston and later moved on to New York City where entered a life of crime, ending up in jail in 1946. After his release from jail he quickly rose in the ranks of the Nation of Islam, serving as minister in Philadelphia and New York City in 1954. In 1955, he and the believers helped recruit Louis Eugene Walcott (now the Honorable Minister Louis Farrakhan), a popular entertainer, to enroll in the Nation of Islam. In Dec.1963, in a speech in New York City, he denounced the recently assassinated President John F. Kennedy, disobeying an order from the Hon. Elijah Muhammad not to discuss the situation. By March 1964, Malcolm X announced his separation from the Nation of Islam. His separation from the Nation of Islam, he later admitted, was based on his misunderstanding of the personal life of the Honorable Elijah Muhammad. 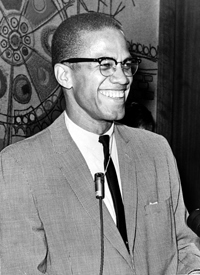 On Feb. 21, 1965, in New York’s Audubon Ballroom, he was assassinated amidst a plot monitored and encouraged by the Federal Bureau of Investigation and Central Intelligence Agency to counter the rise of Black leadership in hopes of destroying both Malcolm X and the Nation of Islam in one act, analysts believe.